The new Vitalograph copd-6 offers fast, simple and effective screening of those at risk for COPD. The dual zone indicators provide an instant indication of both the obstructive index and the COPD classification. Using NHANESIII predicted values, the copd-6 measures and displays FEV1, FEV6, FEV1/FEV6 and percent of predicted. The copd-6 USB links to your PC to produce an electronic PDF for attaching to patient’s file and hard copy color reports. Patients with measurements within the normal range can be screened out, allowing diagnostic spirometry resources to be focused on those most at risk. 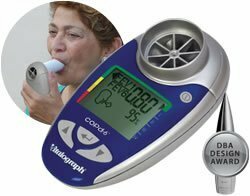 This pioneering device screens out those with normal FEV1, and who therefore do not have COPD, without the risk of false COPD negatives, allowing spirometry resources to be focused on those most at risk. About one in four adults age 35 and over can be expected to develop chronic obstructive pulmonary disease (COPD), new research suggests. "This is a disease that is underreported. But it is still the fourth leading cause of death worldwide and it is projected to be the third cause of death within two decades," Gershon tells WebMD. In some people, COPD is caused by a genetic condition known as alpha-1 antitrypsin, or AAT, deficiency. While very few people know they have AAT deficiency, it is estimated that as many as 100,000 Americans have it. People with AAT deficiency can get COPD even if they have never smoked or had long-term exposure to harmful pollutants. Mild COPD: The first stage of COPD is termed “Mild COPD”. Typically, your spirometry test indicates mild airflow restriction. During the first stage of COPD, it is difficult to breathe after simple activities. It is much better to begin COPD treatment during the early COPD stages. This is especially true considering you may not even be aware of decreased lung ability. Since there is no cure for this condition, getting treatment early will ease the discomfort and quite likely hold its progression to a slower rate. Moderate COPD: The second stage of COPD is termed “Moderate COPD”. Typically, your spirometry test indicates a worsening airflow restriction. It’s at this stage when people usually seek medical attention. Due to breathing issues, many will cut down on certain day-to-day activities. As with the mild stage, treatments exist, but no cure is available. There’s a chance that once at this stage, the disease will continue to progress, leaving one to battle severe COPD. Severe COPD: Typically, your spirometry test indicates severe air flow restriction. This stage of the disease can be unbearable for some. It is at this stage that one realizes just how afflicting this disease is. Treatment helps to alleviate some symptoms. Treatment can ease discomfort and make life more manageable. This is especially true if treatments are applied during the early COPD stages. COPD is a progressive disease, but as it’s always advantageous to catch it early. The stages of COPD are often defined according to your symptoms plus a measure of how well your lungs work, which is called your "lung function." The National Heart, Lung and Blood Institute estimates that 12 million adults have COPD and another 12 million are undiagnosed or developing COPD. COPD kills more women than men each year. In 2006, COPD killed more American women than breast cancer and diabetes combined. An emphasis on preventive care, catching, diagnosing and treating disease states early is critical to improved outcomes. This is especially the case with chronic obstructive pulmonary disease (COPD), a progressive disease that makes it hard to breathe, according to the National Heart, Lung and Blood Institute. COPD can cause coughing that produces large amounts of mucus, wheezing, shortness of breath, chest tightness, and other symptoms. COPD is slow developing, but has very serious health implications. Long-term exposure to irritants that damage the lungs and airways is typically the cause of COPD. In the United States, the most common irritant that causes COPD is cigarette smoke. Pipe, cigar, and other types of tobacco smoke also can cause COPD, especially if the smoke is inhaled. Breathing in secondhand smoke, air pollution, or chemical fumes or dust from the environment or workplace also can contribute to COPD.